Now I am a sucker for a buff, tan arm with some badass tattoos on it. Plus we both had our windows rolled down…I was feeling a good vibe here. In my single days, I just might have written my phone number down on an old receipt and plastered it against the window. Well, that wouldn’t have worked since my window was down. Regardless, I am not single, so I did nothing but look innocently in his direction. I thought it was sly, but nothing I do is ever sly or subtle. It was obvious, as is my specialty. 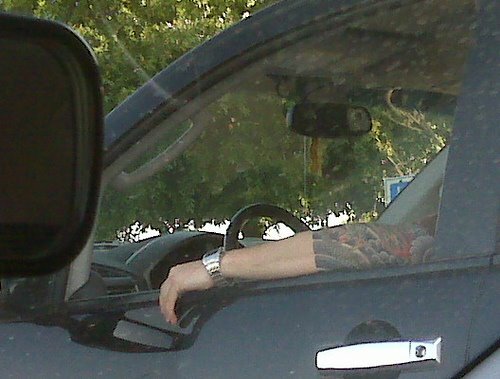 But it wasn’t unwanted, because I saw Mr. Tats looking back in my direction. I was feeling high on vehicle flirting when I got to work. My Nalgene bottle broke right before I entered the door. How does that happen? you ask. I thought they were indestructible. Well so did I. Apparently they are destructible but only if you chew the loop-top lid incessantly as I do. Oh well, I have three others. I knew there was a reason I bought so many. There is a small woman at my job who works downstairs so I have never talked to (I work upstairs), but every Friday without fail she says, “Happy Friday!” With an exclamation point. And today I grinned after hearing it knowing that she too – this woman who is always smiling and seems nothing could ever be wrong – lives looking forward to the weekend. She also counts down days, then hours, then minutes, and finally seconds until she can Ctrl+Alt+Delete her computer up, grab her keys, and sprint to her car.